80 wizard and 78 SK with cleric mercs dropped this guy fairly easily. He does engrage. Thanks for the heads up on the summon we were gonna try to kite him originally! Soloed this guy today. i'm an 80 mage with about 636 AAs and mostly Blackburrow/Lower Guk gear (revamped obviously) and a touch of SoF group/Solteris/Steam Factory/Crystallos items with a 65% focused pet (Winged Gem of Command). it took me 3 trys. i burned every AA i had (Replenish Companion rk 2, Companion's Blessing rk 1, Fortify Companion rk 3, Host of the Elements rk 8, Servant of Ro rk 4, Frenzied Burnout rk 1 EVEN Companion of Necessity near the end for stuns to break his enrage up a bit... atleast i think he enraged.... he hit harder and more near end but i wasn't reading i was focused on casting in time lol) and spammed Rancorous Servant on the mob when i could and then spammed pet with heals over and over and over. My pet was self buffed (rk 2 of every pet buff plus 2.0 clicky) and cleric/ranger buffed. My pet ended up about 4% hp left at the end (he gets very scary near end of battle). 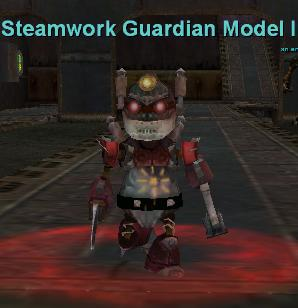 He dropped Clockwork Gnome Gear, High Quality Steel Gear, Clockwork Grease, Small Clockwork Screws, Glossy Silk Hat. I'm impressed that you soloed this guy, a cool feat. I kill him regularly and while he's not a particularly tough mob, I wouldn't dream of trying to solo him. Our bard dies pretty regularly at the end of the fight. This guy has the ability to Wild Rampage, which seems to come when he hits low health. His max hit against the full defensive, 4.1K tank was 3,060, average hit was around 1,400, and he did 1100 dps. It was relatively trivial for the healer to keep the tank up, nothing special. But like I said, we lost the bard at the very end of the fight at least twice when his hit points vanished. Of the three named I've seen at this camp, he's the easiest by far. He's also the most common. Camped this guy tonight for about 4 hours or so. We got him to spawn 5 times which yielded 3 warped steel helms, 2 scratched hide helms and a sad wizard! We were camping just to the left of the elevators on the top floor and only 1 or 2 roamers came near that area. Found this guy roamer on the 3rd floor killed him with a 18700hp 2564ac monk with 2000 AA's hit for 3700 max rest of the group is 80 shama 80 cleric and another 80 monk. shm and clr just kept spamming heals and after the 3 try he went down very tough fight but was hella fun dropped the Warped Steel helm. Done with Bard, Warrior (17k hp buffed, 3.8k AC, defensived the fight), 3 clrs, 1 druid, rogue, all DPish geared. Bard slowed but still hit fast, but with 3 clerics fast healing tank never went below 30. About 3883 max hit for a defensive war with about 3,700 ac. He also drops the glossy silk hat.